Hannah Arendt is one of the most prominent thinkers of modern times, whose profound influence extends across philosophy, politics, law, history, international relations, sociology, and literature. Presenting new and powerful ways to think about human freedom and responsibility, Arendt's work has provoked intense debate and controversy. 'Hannah Arendt: Key Concepts' explores the central ideas of Arendt's thought, such as freedom, action, power, judgement, evil, forgiveness and the social. Bringing together an international team of contributors, the essays provide lucid accounts of Arendt's fundamental themes and their ethical and political implications. The specific concepts Arendt deployed to make sense of the human condition, the phenomena of political violence, terror and totalitarianism, and the prospects of sustaining a shared public world are all examined. 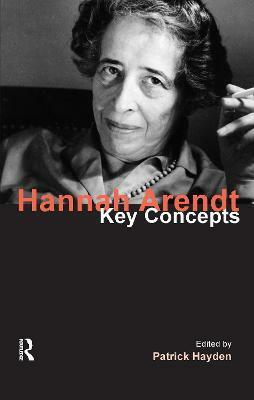 'Hannah Arendt: Key Concepts' consolidates the disparate strands of Arendt's thought to provide an accessible and essential guide for anybody who wishes to gain a deeper understanding of this leading intellectual figure. Patrick Hayden is Professor of Political Theory and International Relations at the University of St Andrews, Scotland.